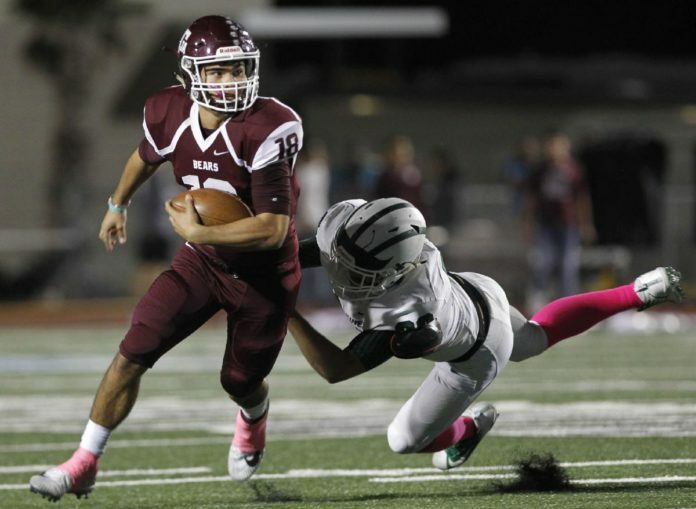 PSJA High quarterback Trey Guajardo dodges a tackle from PSJA Memorial's Sal Ramirez during the first quarter of their game Friday, October 27, 2017, at PSJA Stadium in Pharr. PSJA High is 8-0 and 5-0 in District 31-6A, as is Edinburg Vela. This one doesn’t require much thought. After Vela’s 48-7 win over PSJA North on Thursday, coach John Campbell was also chomping at the bit for the big matchup. The most critical matchup in The Monitor’s Game of the Week, which will take place at 7 p.m. Thursday at PSJA Stadium in Pharr, is the quarterbacks. Guajardo leads the Rio Grande Valley in passing yards with 2,460. No one else is over 2,000 on the year. He has 26 touchdowns on the season and a completion percentage of 67. Vela senior Nathan Garcia has 1,748 yards on the year to go with 17 TDs and a 66 completion percentage. The one area in which Garcia has the biggest advantage is in ball security. Garcia only has 2 interceptions on the year compared to 7 for Guajardo. The defensive matchup will also be spotlighted. Coming into Week 9, Vela was allowing 252.6 yards per game, the best mark in 31-6A, while PSJA was right behind with 278.1. The SaberCats allow an average of 12.2 points per game, and the Bears on average give up 13.5. The stakes on this matchup aren’t just the first loss of the season or bragging rights, either. For PSJA High coach Lupe Rodriguez, Vela has long been a team he was competing against for the top spot. Thursday will be no different.